2] If you know an informed and sympathetic clinician, psychologist, allied health professional, lawyer, educator or social worker, contact them today and urge them to review these criteria and to submit a response as a concerned professional, or ask your state ME/CFS organization to submit a response. How many subscribers are there to the Co-Cure mailing list? And there are over 4,500 members of Phoenix Rising Forums. These usually very active forums are currently offline. Please use the time and energy you might have spent on Phoenix Rising to submit a comment. We have the potential for several thousand more responses over the next three days. OK, the APA issued no prior announcement of its intention to bring forward this second public review of draft criteria and so patient groups could not be alerted in advance. But alerts went out on May 5, the day after the latest criteria were posted on the DSM-5 Development site. Nevertheless, many international patient organizations have been slow off the mark and some have been lukewarm about the need to submit, this year, or to submit, at all. I’ve been banging on about the implications for these proposals for ME and CFS patients for two years, now, but where are the responses from our international patient organizations to these latest proposals? Yet these radical proposals for renaming the “Somatoform Disorders” category “Somatic Symptom Disorders” and combining a number of existing, little-used categories under a new umbrella term, “Complex Somatic Symptom Disorder (CSSD)”, and the more recently proposed “Simple Somatic Symptom Disorder (SSSD)”, have the potential for bringing thousands more patients under a mental health banner and expanding markets for psychiatric services, antidepressants and behavioural therapies such as CBT, for the “modification of dysfunctional and maladaptive beliefs about symptoms and disease, and behavioral techniques to alter illness and sick role behaviors” for all patients with somatic symptoms, irrespective of cause. CFS, ME, Fibromyalgia and IBS patients are likely to get caught by these proposals. CFS and ME patients already diagnosed or waiting for a diagnosis (which might take months or years) would be especially vulnerable to the highly subjective criteria and difficult to measure concepts like “disproportionate distress and disability”, “catastrophising”, “health-related anxiety” and “[appraising] bodily symptoms as unduly threatening, harmful, or troublesome”, this Work Group is proposing. Other patient groups bundled under the so-called “Functional somatic syndromes” and “medically unexplained” umbrellas, like Chemical Injury (CI), Chemical Sensitivity (CS), chronic Lyme disease and Gulf War Illness, would also be highly vulnerable to a CSSD label. These proposals could potentially result in misdiagnosis of a mental health disorder, misapplication of an additional diagnosis of a mental health disorder, misapplication of “rehabilitation” therapies like GET or iatrogenic disease. Families would be at risk of wrongful accusation of “over-involvement” or “excessive” concern for a child’s symptomatology or of encouraging “sick role behaviour” in a child or young person. Application of these vague and highly subjective criteria may have considerable implications for the diagnoses assigned to patients, for the provision of social care, payment of employment, medical and disability insurance and the length of time for which insurers are prepared to pay out. The application of a diagnosis of CSSD may limit the types of treatment, medical investigations and testing that clinicians are prepared to consider and which insurers are prepared to fund. This is not a US centric issue. The DSM is used to a varying extent in other countries in clinical settings. DSM criteria are currently used more often for research purposes than ICD-10 and the next edition will shape international research, influence literature in the fields of psychiatry and psychosomatics and inform perceptions of patients’ medical needs throughout the world. Please make use of these last three days to tell the APA why the Somatic Symptom Disorders Work Group needs to rip up these proposals and start over again. The closing date for comments in the second DSM-5 public review is June 15. I have submitted the comments below to the DSM-5 Work Group on Somatic Symptom Disorders. We are very concerned about the proposed new diagnosis, Complex Somatic Symptom Disorder, and its potential influence on physicians who see patients with CFS/ME. On behalf of the board of directors and the membership of the International Association for Chronic Fatigue Syndrome (IACFS/ME), I would like to express my deep concern about the proposed new category of Complex Somatic Symptom Disorder (CSSD) in DSM-5 scheduled for release in 2013. The Work Group’s well-reasoned points about DSM-IV somatoform disorders – that they are little used, confusing, and pejorative – do call for a re-evaluation. The question is: What should replace them? The new inclusive CSSD category attempts to offer a simplified and more inclusive diagnosis that may be more user-friendly to physicians and other health practitioners. Our major concern is that the logic behind the new CSSD category is not informed by empirical data that directly examines the utility of this diagnosis in medical practice. Given the absence of scientific validation of the CSSD diagnosis, the potential for unintended consequences is a serious concern. One such consequence is the possibility of over-diagnosis that may selectively affect patients with illnesses that are already not well understood such as CFS/ME. If the treating practitioner is skeptical about the severity or even existence of CFS/ME, then the new criteria can be used to diagnose CSSD without reference to an underlying illness. For instance, the CSSD criteria of (2) Disproportionate and persistent concerns about the medical seriousness of one’s symptoms and (3) Excessive time and energy devoted to these symptoms or health concerns, would allow practitioners skeptical of CFS/ME to diagnosis the illness as an Axis I psychiatric disorder. This new psychological diagnosis may then narrow the physician’s focus and reduce the possibility of more effective management of the CFS/ME illness. Furthermore, the CSSD diagnosis may result in additional stigma for already marginalized patients with CFS/ME. Over-diagnosis with CSSD may also arise from the broad generality of the new criteria and the absence of clear thresholds for patients to meet the criteria. As with somatization/somatoform disorders, when different criteria are used population prevalence varies from less than 1% for somatization disorder to an astonishing 79% for undifferentiated somatoform disorder (cited from Work Group online document). Arguably, the generality of the criteria for both undifferentiated somatoform disorder and CSSD suggests that CSSD may become a much more common (and potentially misapplied) diagnosis than the somatic symptom disorders that it replaces. Finally, the CSSD diagnosis will not inform the clinician of CFS/ME-specific issues such as adverse reactions to treatment that are more likely in this hypersensitive population. By contrast, the CFS/ME diagnosis is useful for an array of illness related concerns that will assist the clinician in providing care for these medically under-served patients. Given the above considerations, we ask that the CSSD diagnosis be omitted from DSM-5. Only when the proper validation studies are done that consider vulnerable populations such as CFS/ME can we know if the use of the CSSD diagnosis has clinical value. In its current form, we believe that the new diagnosis will do more harm than good. In Part 3 of this report, I set out extracts from the first of two key PDF documents that accompany the latest proposals of the DSM-5 Somatic Symptom Disorders Work Group, highlighting in yellow why ME and CFS patient representation organizations, professionals and advocates need to register their concerns. Stakeholder feedback in this second public review is being accepted until 15 June. In the first part of this report, I addressed some of the queries that have been raised around the second public review of proposals for the revision of DSM categories and diagnostic criteria. Stakeholder feedback is being accepted now until 15 June and I’ll be giving more information on how to submit feedback via the DSM-5 Development website in a forthcoming post. In this post, I am setting out the latest proposals (dated 14 April 2011) from the DSM-5 Somatic Symptom Disorders Work Group, as published on the DSM-5 Development website, on 4 May. The next post will set out extracts from the two key documents that accompany these revised proposals and why ME and CFS patient representation organizations, patients and advocates need to register their concerns via this second public review. Criteria proposals and rationales are expanded upon within the two key documents and the devil is in the detail. Patient organizations will need to review both documents, as changes have been made since last year. And if you are able to do so, I recommend that patients, carers and patient advocates read them, too. At over a dozen pages long, the “Rationale” document (which is titled: “Justification of Criteria — Somatic Symptoms”) looks potentially daunting, but the text is not as long as it appears since five or six pages of references are included at the end. Edits to the documents since the versions published in January, this year, have been highlighted by the Work Group in yellow. Below, I am posting proposal details for categories J 00 thru J 04. Note that the two key PDF documents, dated 14 April 2011 called: “Disorder Descriptions” (7 pages) and “Rationale” contain full disorder descriptions and rationales for all category proposals in the Somatic Symptom Disorders categories, so you need only download one copy of each PDF. Patient organisations, professionals and advocates submitting comments in the DSM-5 draft proposal review process are invited to provide copies of their submissions for this second and current public review for publication on this site. A number of patient advocate submissions are also published. DSM stands for Diagnostic and Statistical Manual of Mental Disorders. The DSM is published by the American Psychiatric Association (APA) and contains descriptions, symptoms and criteria for diagnosing mental disorders. It does not include information or guidelines on treatments. DSM is the primary diagnostic system in the US for defining mental disorders and is used to a varying extent in other countries. As a classification system, DSM does not have quite the significance in the UK as Chapter V: Mental and Behavioural Disorders of the WHO’s ICD-10, which is used more often in Europe for classifying mental health disorders. But the next edition of DSM will shape international research, influence literature in the fields of psychiatry and psychosomatics and inform health care providers and policy makers’ perceptions of patients’ needs for many years to come. The next edition of DSM, which will be known as DSM-5, is scheduled for publication in May 2013. Diagnostic criteria defined within the DSM determine what is considered a mental disorder and what is not, what medical treatments individuals receive and which treatments medical insurers will authorise funding for. In addition to use in medical settings, DSM is also used by social services agencies, governments, policy makers, courts, prisons, drug regulation agencies, pharmaceutical companies and in research. On 4 May, the APA published revised proposals for the 13 Work Groups for the revision of DSM-IV categories and diagnostic criteria on the DSM-5 Development website and issued a news release announcing a second stakeholder review and feedback exercise. According to the DSM-5 Timeline, as it stood in March, this second public review was not expected until August-September. Q: Is this review and comment process open only to APA members and other professionals? A: No. All stakeholders are invited to submit comment and feedback on the draft framework and the latest proposed revisions to diagnostic criteria: patients and families, patient advocates and patient representation organizations as well as clinicians, researchers, allied health professionals, lawyers and other end users. Q: How long will this second review period run for? A: The DSM-5 Development website is open for commenting now until 15 June. Q: Is registration required in order to submit feedback? A: Yes. You will need to register to submit comment to the Work Groups. You can register now on the DSM-5 Development site to participate. Once registered, you can prepare and upload your comment via a WYSIWYG editor anytime until 15 June. More information on registering to submit feedback in Post #78. 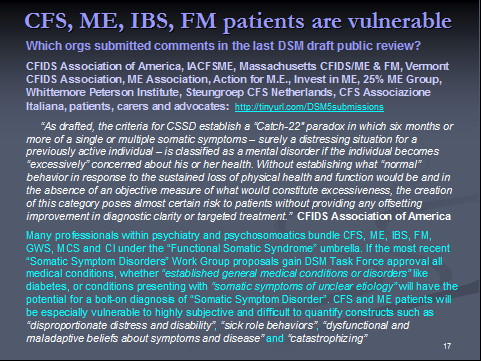 Q: Which DSM-5 Work Group proposals have potentially the most implications for CFS and ME patients? A: The DSM-5 Work Group which has the most relevance for “Chronic fatigue syndrome”, CFS, “ME”, “CFS/ME”, “ME/CFS”, IBS, Fibromyalgia, Chemical Sensitivity (CS), Chemical Injury (CI), Environmental Illness (EI), GWS and chronic Lyme disease patients is the Somatic Symptom Disorders Work Group (SSD Work Group) which has responsibility for the revision of the categories currently classified in DSM-IV under “Somatoform Disorders”. Q: Where can I find copies of the comments submitted last year by ME and CFS patient organizations during the first public review? Q: How many submissions did the 13 DSM-5 Work Groups and Task Force receive during the first review? A: The APA reports having received over 8000 comments across all categories. After the review period had closed, the Task Force did not publish summaries of key areas of concern brought to its attention by stakeholders and neither has the Task Force nor individual Work Groups published responses to areas of major concern. Q: How many submissions were received in response to the proposals published last year for the “Somatic Symptom Disorders” categories? A: The APA did not publish a breakdown of the numbers of responses received by each of the 13 Work Groups. 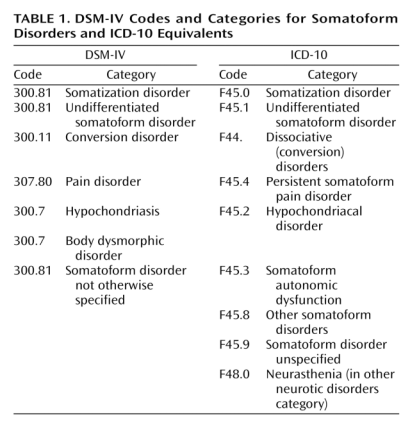 Q: How do the current DSM-IV categories for “Somatoform Disorders” compare with ICD-10? Source: Mayou R, Kirmayer LJ, Simon G, Kroenke K, Sharpe M: Somatoform disorders: time for a new approach in DSM-V. Am J Psychiat. 2005;162:847–855. Neurasthenia is not categorized in DSM-IV. Neurasthenia is classified in ICD-10 in Chapter V Mental and behavioural disorders, at F48.0, as shown in the table, above. Chronic fatigue syndrome is not classified in DSM-IV. Chronic fatigue syndrome is indexed in ICD-10 to G93.3, (Chapter VI Diseases of the nervous system – the Neurology chapter), the same code to which PVFS and (Benign) ME are classified. ICD-10 has “Fatigue syndrome” [Note: not “postviral”; not “chronic”] coded at F48.0 in Chapter V, which specifically excludes G93.3 Postviral fatigue syndrome. Q: What does “Harmonization” between DSM-IV and the forthcoming ICD-11 mean? A: The APA participates with the WHO in an International Advisory Group for the Revision of ICD-10 Mental and Behavioural Disorders and a DSM-ICD Harmonization Coordination Group. The WHO acknowledges there may be areas where congruency between the two systems may not be achievable. 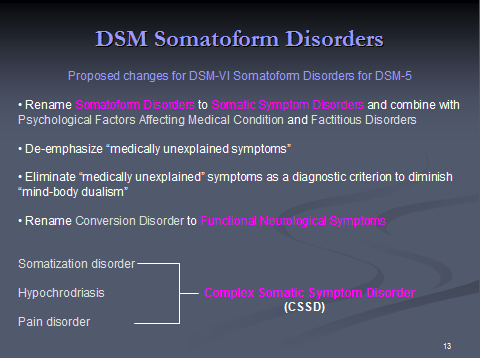 Q: Is ICD Revision intending to harmonize its Somatoform Disorders categories with the current proposals for DSM-5? A: DSM-5 proposals are a “work in progress”. 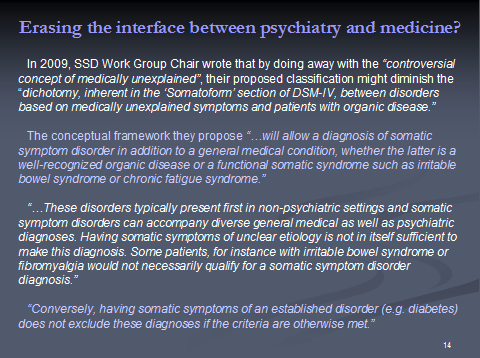 The proposals of the Somatic Symptom Disorders Work Group for the revision of categories within this section represent a radical restructuring of the current DSM-IV Somatoform Disorders; following fields trials, the Work Group will review and potentially revise their proposals. These proposals may be found to be inoperable in the field or otherwise unacceptable to clinicians participating in field trials. The Task Force may require the Work Group to make substantial modifications to the current proposals. A third public review is scheduled for January-February 2011 prior to the finalization of categories and criteria. It’s not known how closely the DSM-5 Work Group for “Somatic Symptom Disorders” are collaborating with the ICD Revision working group responsible for overseeing the revision of ICD-10’s Somatoform Disorders categories. There have been no minutes or summaries of meetings of the International Advisory Group for the Revision of ICD-10 Mental and behavioural disorders, in which the APA participates and which is chaired by DSM-5 Task Force member, Steven E Hyman, MD, published since December 2008 (a point raised recently with the WHO’s Dr Bedhiran Üstün) and the ICD Revision Topic Advisory Group for Mental Health does not issue public reports on its progress. 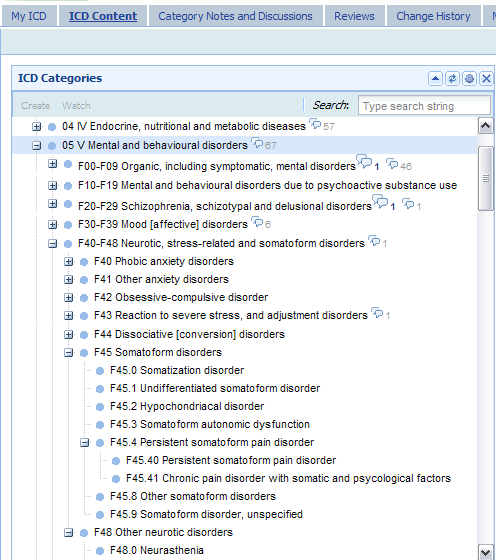 From what is understood of ICD taxonomic and ontological principles, the conceptual framework and radical restructuring of the Somatoform Disorders currently proposed by the SSD Work Group, might prove difficult for ICD-11 to assimilate even if ICD Revision were to consider the proposals, per se, to be valid constructs that could be used reliably. Q: What proposals are being put forward for the revision of the DSM-IV categories currently known as “Somatoform Disorders”? A: The SSD Work Group is recommending renaming the “Somatoform Disorders” disorders section of DSM-IV to “Somatic Symptom Disorders”. The Work Group proposes combining existing categories – Somatoform Disorders, Psychological Factors Affecting Medical Condition (PFAMC), Factitious Disorder and Factitious Disorder imposed on another (previously known as Factitious Disorder by proxy) into one group entitled “Somatic Symptom Disorders”. Alternatively, Factitious Disorders would be listed under the category “Other Disorders”. There is a relatively recent additional proposal for a category called “Simple (or abridged) Somatic Symptom Disorder” (SSSD). These proposals would represent a major change in the diagnostic nomenclature for this section of the DSM. Q: Have there been changes since the publication of the initial proposals, in February 2010? A: Since the first public review, the Work Group has modified the criteria for “Complex Somatic Symptom Disorder (CSSD), added a new proposal for a category called “Simple Somatic Symptom Disorder” and made revisions to the text of the two key PDF documents. So you will need to review the most recent criteria and the two key documents that accompany these latest proposals if you are intending to submit comment. I shall be posting the latest proposals for criteria and the two key “Disorder Description” and “Rationale” documents in the next post (Post #77). ARLINGTON, Va. (May 4, 2011) The American Psychiatric Association today released the organizational framework proposed for the fifth edition of the Diagnostic and Statistical Manual of Mental Disorders (DSM). This restructuring of the DSMs chapters and categories of disorders signals the latest scientific thinking about how various conditions relate to each other and may influence care. The APA is again inviting comment from the public and mental health and other professionals who use the manual for both diagnostic and research purposes. The revisions reflect the knowledge we have gained since the last DSM was published in 1994, said David Kupfer, M.D., chair of the DSM-5 Task Force. They should facilitate more comprehensive diagnosis and treatment approaches for patients and encourage research across diagnostic criteria. The changes re-order the existing manuals 16 chapters based on underlying vulnerabilities as well as symptom characteristics, which currently result in many patients being diagnosed with multiple disorders within and across disorder groups. The chapters are arranged by general categories such as neurodevelopmental, emotional and somatic to reflect the potential commonalities in etiology within larger disorder groups. The sequence of chapters builds on what we have learned about the brain, behavior and genetics over the past two decades, noted Steven Hyman, M.D., former director of the National Institute of Mental Health and a member of the DSM-5 Task Force. Public comment is invited through June 15 on the draft framework and the latest proposed revisions to diagnostic criteria, both available on http://www.dsm5.org. During an initial public review and comment period last year an unprecedented occurrence in both the field of psychiatry and in medicine the APA received more than 8,000 written responses from clinicians, researchers and family and patient advocates. All of the responses were considered as part of the manuals reorganization. Todays release marks another stage in the development of DSM-5. Rigorous scientific scrutiny is shaping this 14-year project, with the involvement of nearly 500 experts from the United States and abroad. Publication is scheduled for 2013. The manuals new organization combines certain disorders under more comprehensive chapter headings while breaking others out from their previous categories. One example is obsessive-compulsive disorder (OCD), long considered to be an anxiety-driven disorder. Recent studies have shown that OCD and several related disorders involve distinct neurocircuits, and so they are now listed as a separate grouping a move that could advance understanding of their root causes. There are other notable changes. Disorders previously listed under a single rubric of infancy, childhood and adolescence have been integrated into other chapters, in line with the goal of making DSM more developmentally focused. In addition, research findings linking schizophrenia and schizotypal personality disorder into a schizophrenia spectrum will be reflected in this next edition. The schizophrenia spectrum designation is supported by studies showing how these disorders tend to aggregate within families, said Darrel Regier, M.D., M.P.H., vice chair of the DSM-5 Task Force and executive director of the American Psychiatric Institute for Research and Education. It will help clinicians to correctly diagnose patients by making clear the common features that fall within the spectrum. To date, reports on the deliberations and progress of the task force and 13 work groups have been presented at international conferences, through more than 100 papers and via the DSM-5 website. After last years public comment period, the work groups continued to amend and refine some categories of disorders. The first round of field trials is now testing the new diagnostic criteria in real-world settings, including at nearly a dozen larger academic and clinical centers; almost 3,900 mental health professionals in individual practice and smaller settings also will participate before the trials conclude. Another public comment period on the criteria will then follow. The DSM-5 framework and diagnostic criteria will be determined by 2012 and submitted to the APAs Board of Trustees for review and approval. At every stage, said Kupfer, DSM-5 is benefiting from a depth of research and a breadth of expertise and diverse opinions that will immeasurably strengthen the final document. The American Psychiatric Association is a national medical specialty society whose more than 36,000 physician members specialize in the diagnosis, treatment, prevention and research of mental illnesses, including substance use disorders. Visit the APA at www.psych.org and www.healthyminds.org.